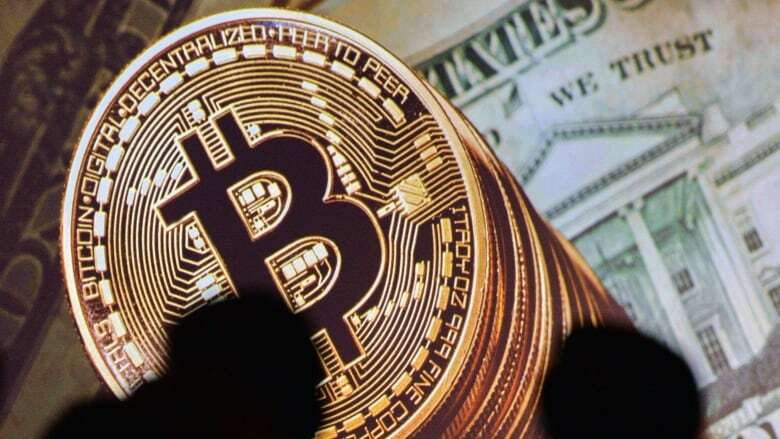 Bitcoin zoomed past $11,000 US on Wednesday and then just as quickly dropped to $9,000, stoking concerns that a rapidly swelling bubble could be set to burst in spectacular fashion. The price of a bitcoin — a cryptocurrency that has ballooned in value this year — fluctuates depending on the exchange where it is being purchased, but a little after 9 a.m. ET Wednesday on Coinbase, the price topped out at $11,395 per bitcoin, an all-time high. By 2:30 p.m. ET, however, the currency had lost more than $2,000, bottoming out at around $8,600 per coin before recovering back up to near the $10,000 level again. Even after Wednesday's seesaw day, the value of bitcoin has gained more than 1,000 per cent this year, a rapid ascent that led to countless warnings that it has reached bubble territory. But the warnings have had little effect, with dozens of new crypto-hedge funds entering the market and retail investors piling in. Coinbase, the world's largest provider of digital wallets to store cryptocurrencies like bitcoin, said earlier this week that it had 300,000 new members sign up for a wallet on the service over the U.S. Thanksgiving holiday. All in all, the site now has 13 million different active bitcoin wallets. British-based website Blockchain.info said it added 100,000 new customers on Tuesday alone, bringing its own tally to 19 million people. Most evidence suggests that few people piling into bitcoins are using it as a currency, and most are simply using it as a hot investment. "What's happening right now has nothing to do with bitcoin's functionality as a currency — this is pure mania that's taken hold," said Garrick Hileman, a research fellow at the University of Cambridge's Judge Business School. Bitcoin, which was invented in 2008 by an anonymous computer programmer, allows people to transfer money to each other via a secure and anonymous ledger. That ledger is known as a blockchain, and people who contribute to it by doing energy and labour-intensive computer calculations are known as bitcoin miners. Proponents of bitcoin love the technology because its value cannot be artificially influenced by governments the way other currencies can. But wild swings in its price are common. Japanese investment bank Nomura noted in a recent report on bitcoin that less than one per cent of all bitcoin miners in the world control 88 per cent of all the bitcoins in existence so far. "The bitcoin price is easily manipulated," the bank said in a report last week. But warnings like that aren't stopping major investment names from piling into the space. Reuters reported Wednesday that the Nasdaq was planning on launching a bitcoin futures contract in the first half of 2018. That will allow investors to buy and speculate on the value of bitcoin without actually having to own it themselves, a development that's likely to add to its prevalence. "It's got all the shapings of your tulip bubble chart [but] that tells you nothing about where that price line could go depending on the number of people who wish to own it," Standard Life's head of investment strategy Andrew Milligan said on Wednesday. "Who is to say it doesn't reach $100,000?" Technology pioneer John McAfee famously predicted in 2014 that bitcoin — then worth around $500 — would be worth $5,000 by the end of 2017, a figure it has already doubled with one month to go. On Wednesday, he predicted on Twitter that the price of a bitcoin would hit $1 million by 2020. In some emerging markets, bitcoin is worth even more than it is on the main trading exchanges. In Zimbabwe, where currencies are notoriously volatile and hard to come by, bitcoin traded at $17,875 on Monday. Wednesday's bitcoin movements are a reminder to many that volatility is the norm with the cryptocurrency. "As many seasoned traders know all too well, anything that rockets higher, tends to fall down faster when the time comes, and the time will come," James Hughes, chief market analyst at FX broker AxiTrader, said.